Today, most people prefer to buy goods made in the US and produced by American brands. This is also true when it comes to showerheads and other shower and bath fixtures. However, among the companies making top-rated showerheads, there are quite a few foreign ones. Toto is one of them. Toto is the leading producer of sanitary and plumbing goods in Japan. Their produce is considered the best and is installed in many Japanese homes. Their goods are also ranked quite highly on the international market and are imported into many countries throughout the world. The brand has earned a good reputation since its foundation in 1917. They have proven to be a company that always offers technological innovations and high standard of quality to their customers. The Japanese are known to value their bathroom routine like no other nation in the world. To them, the bathroom is not just a functional place where they can get clean and perform different types of personal grooming. In the Japanese tradition, bathing is a ritual that can help you relax, restore the life energy, and transition into a meditative state of mind. There is even a saying that in the West a bath is where you clean the body, but in Japan it is where you cleanse your soul. The fact that Toto’s goods are able to satisfy even the most demanding bathroom enthusiasts speaks for itself. One of the main principles that have been guiding the brand ever since its creation is cleanliness. It has led to the creation of the Clean Technology that is applied in the making of their every product. This concept is vital, as purity and cleanliness are the very essence of each aspect of Japanese culture. Apart from improving personal cleanliness, the Clean Technology is aiming at improving the environment, making it cleaner and greener. Toto does everything possible to make eco-friendly products that are water-saving and energy-efficient. Apart from that, the Clean Technology allows using fewer chemicals in order to keep the bathroom cleaner. Some of their fixtures are powered by water, others come with the ability to make the air considerably cleaner. Another advantage of Toto’s products is an undeniably elegant design. The Japanese are known for their passion for order and beauty in everything. All the fixtures from Toto are small masterpieces. Each element of their design is refined and sophisticated. Choosing a showerhead from Toto, you will bring balance and integrity into the décor of your bathroom. This extra-large model will offer a perfect coverage for a unique showering experience. Its design comprises a 9×9-inch showerhead, a shower arm, and an escutcheon. The unit comes with just one water setting — rain spray — and the maximum water flow rate of 2.5 GPM. 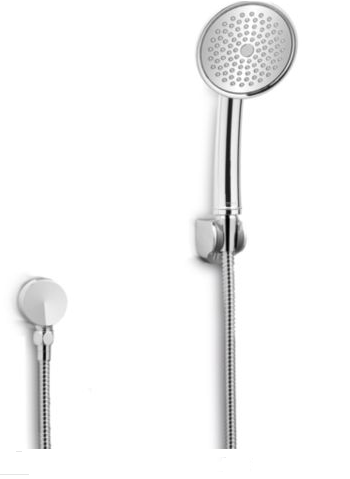 The Upton showerhead is a stylish and practical unit. Its sleek square shape and glossy chrome finish look chic and sophisticated. Its design will look great in a bathroom decorated in a modern style. Although, it is versatile enough to work with a classic décor just as well. The showerhead comes with rubber nozzles for easy cleaning. This basic hand shower will be a nice option for people with minimalist needs and a traditional look on design. 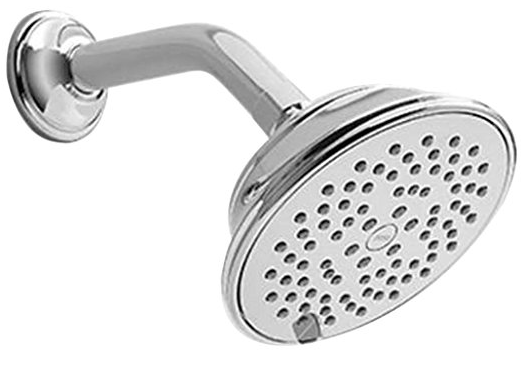 It is a single-function showerhead that comes without any extra features. This model comes in three finish colors, nickel, brushed nickel, and polished chrome. A hose and wall bracket are not included and must be bought separately. This Single-Spray hand shower comes with a 4 1/2 –inch showerhead comprising a spray face with a four-inch diameter and a ½-inch connection. It comes with easy-clean nozzles that prevent the buildup of hard water deposits. This hand shower can create a vigorous and energizing spray thanks to its high flow rate. This multi-function showerhead will bring a little diversity into the boring showering routine. It can offer five unique water patterns: spray, spray and massage combination, massage, mist, and pause. With this showerhead, you can turn your shower into a highly functional unit. The high-end design of this Multi-Spray showerhead will enhance the style of your shower considerably. Coming with a versatile chrome finish and a transitional design, it will complement any bathroom décor, from traditional to modern. Its round shape makes it a nice option for those who do not like strict lines and sharp corners. This functional showerhead comes with the same spray settings as the previous model — spray, massage, spray/massage, mist, and pause. It also comes with all the advantages of its counterpart, namely a beautiful design and easy-clean rubber nozzles. 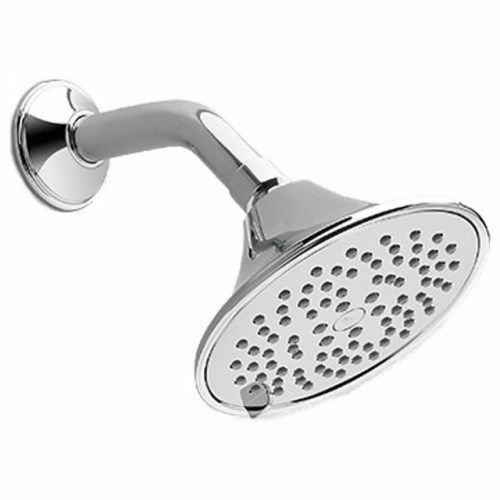 However, this Traditional Collection showerhead can offer another benefit. It has a lower water flow rate and is WaterSense certified. It will be a great option for those who care about the planet or want to save some money on the water bills, or both. In addition to the WaterSense label, it meets the water-efficiency standards of CALGreen. This showerhead will be a great option for those who want to experience a truly invigorating shower but are unable to do that due to the low water pressure in their bathroom. This model will boost the water supply and create a powerful and invigorating spray even in houses with insufficient water flow. This Low Pressure showerhead is one of the most affordable among the models that help to solve the low flow issue. It can be attached to a shower arm and used as a mounted showerhead or fixed to a hose and used as a handheld shower. This model has a minimalist design and looks very neat.